Start this motorcycle ride in a town called Pleasant Gardens, NC which is about 30 mi east of Asheville off US Highway 70. Head north out of Pleasant Gardens on NC 80 and just stay on NC 80 as it crosses the Blue Ridge Parkway and continue north all the way up to US Highway 19 in the town of Micaville, NC. Climbs 2500' in elevation. Crosses Blue Ridge Parkway east of Mt Mitchell. 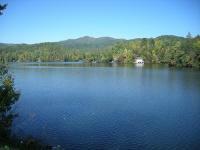 Beautiful lake on south end and great views of Mt Mitchell at Mt Mitchell golf course. Photo contributed by visitor in Jun 09: "A switchback just before the Blue Ridge Parkway." Update provided by CptUSA on 6/25/12: The scenery is beautiful and unimpeded by commercialism. Once past the final residences there is nothing but road road and road. Good road condition. More curves and elevation changes than the Dragon's tail with a lot less traffic also. Several switchbacks. Not for the novice rider. Update provided by CptUSA on 6/25/12: The road is on a steep incline providing a whole new set of challenges. Asphalt is is good condition with only normal brush and gravel from time to time. Light traffic, nasty switchbacks, and towards the top there is a virtual slalom of quick tight turns. Not much here but a great ride. Get on Blue Ridge up to Mt Mitchell. Stop at golf course for something to drink. Fill up before you go. Update provided by CptUSA on 6/25/12: There is nothing on this road but road. Amenities are in Marion at the entrance or in Burnsville many miles beyond the BRP. Update provided by CptUSA on 6/25/12: http://www.thedevilnc80.com/ This gives pictures and descriptions as well. I am not affiliated with the site but having ridden the road dozens of times, I felt it needed its own listing here. on July 21, 2009 7 out of 7 members found this review useful. Found this one by accident when Blueridge was closed at Mt. Mitchell. Took the rider backrest off on the second run to get down lower on the bike, drug the boards a couple times. I like it much better that the dragon. Old guys like me don't care for head-ons from 70 mph from other bikes. on June 2, 2014 2 out of 2 members found this review useful. Upon riding the civilized scenic Blue Ridge, i took a detour onto the aggressive route 80 (South -- Down Hill). Although I only road 10-13 miles of it, this road really put my motorcycle levels to the absolute max. Fantastic steep curves with dips in them, steep "U" corners, blind corners, and fantastic S's. I encountered no traffic on a Saturday afternoon and road conditions are fairly good. This road is not at all for beginners. It had me scraping pegs on some corners going the Speed Limit. on May 30, 2014 2 out of 5 members found this review useful. RIDERS BEWARE: just north of the Mt Mitchell Golf Course on Hwy 80 is a curve that turns very sharply at the end. Unexpected. I live across the river from this curve and there are many fatal accidents at this spot on the highway every year. Lucky me I get to hear them happen. Be Careful of this Turn. Just after the golf course if you are riding north from Marion or the Parkway. And enjoy your ride. on June 3, 2013 2 out of 4 members found this review useful. Don't blame the road for a riders lack of skill. The road did not kill him. His mistake did. on December 3, 2010 2 out of 2 members found this review useful. Being from the micaville area I've ridden almost every inch of route 80. This is definitely a must ride if you love tight twistys with little to no police activity. It gets a little tight for high speed once you hit Buck Creek, but still a lot of fun. Not the best road for novice riders, especially going down. on July 9, 2017 1 out of 1 members found this review useful. on July 11, 2014 1 out of 1 members found this review useful. With respect to the lady who lost a son on this road, there are roads you love to ride with mothers who feel the same about that road. My condolences. I really had a blast on this road. Little traffic and if you wish to look around, you'd best ride ssslllooowww. I didn't find it as intense as I was expecting, still you should be experienced before you try and ride aggressively. Stayed at Buck Creek campground and found the owner to be a fellow rider and more than knowledgeable of the area roads and an all around good guy. Plenty of photo ops available on this and surrounding area. Had a great time and a great ride. I recommend this ride to those looking for the road less traveled. Only a plus that you end up on the Blueridge Parkway. on May 27, 2014 1 out of 2 members found this review useful. on January 5, 2014 1 out of 3 members found this review useful. Far more arduous than the Dragon, steep ascending right-hand turns, beautiful scenery, nearly no traffic. Best kept secret. on May 2, 2013 1 out of 12 members found this review useful. my son read this reviews on what a great fun road this is. He is now in a box on my shelf. He died on this fun road. He was an experienced rider. He hit a guardrail for some reason. There have been 6 fatalities in 20 days on this lovely motorcycle road. thankyou for advertising it as a great road. on September 26, 2012 1 out of 1 members found this review useful. Rode it Eastbound from the BRP makes the tail of the dragon look like childsplay. on September 13, 2010 1 out of 1 members found this review useful. Super fun road, better than the dragon when you consider cops to curves ratio. A must do, if you miss this one you have missed one of the best. Down is best, don't have to catch so many gears! on July 4, 2010 1 out of 1 members found this review useful. I grew up on Highway 80 and know this road like the back of my hand. My parents still live about a mile from the Parkway in the Busick community. I still love riding 80 from the parkway down to Pleasant Gardens (we call it Buck Creek Rd). I would love to see more people riding 80, pass the word. Pretty good road but it does not have more curves than the Dragon's Tail. It has several good switchbacks, and some elevation change. Worth a ride if you are in the area. on May 15, 2016 0 out of 1 members found this review useful. A challenging but rewarding ascent into the beautiful Blue Ridge Mountains, beginning in the small town of Marion NC. The climbing section is a good mix of sweepers and switchbacks with a few brilliant essess thrown in for good measure. The more challenging bits lie beyond the BRP entrance, but most riders do not follow the road the rest of the way out. Not much for roadside stops after you leave Marion until you get to Burnsville or Spruce Pine if you take the Parkway over. The road is becoming much more popular each year so traffic can be heavy at times. Best times to ride are in the early morning before the crowd starts to build. A couple of camp sites are along the straight sections about 1/3 of the way up, so be alert for campers and RVs. on January 29, 2016 0 out of 0 members found this review useful. AFTER SEVERAL RIDES on Blue Ridge Parkway, we took this road home and once up to the parkway. It is a gorgeous roads with everything bikers want. It is steep and curvy with some already mentioned sharp curves. My girl and I loved the road. on October 30, 2012 0 out of 1 members found this review useful. As good as the Dragon.Going back on a 1993 GSX 1100. This is a fantastic ride. Much better then the Tail of the Dragon in my book and more challenging. Just when you get to open the bike up a bit you have to brake and set up for another tight twisty. Hwy 80 is also near some other great roads in the area. Take a trip there you will not be disappointed. This is by far one of the best twisty roads I have ridin on. NC 80, Buck Creek or what ever you want to call it is a great ride with very little traffic and coppers :D. From highway 70 up to the Blueridge Parkway, its about 16 miles of fun! Oh, and did I say dangerous! I ride the road regularly. about 4 years ago I ran of the road and down the mountain side 150 feet. Lucky to still be alive! I was just on NC80 last week. I was leading the pack with some other riders and maybe I was pushing it too hard..... but one of the riders had an accident. It was his 1st time on the road. Had I known, I would have set a slower pace. He was alright though. It did bring back memories of my accident because we had to turn around and go back n find him. If I hadnt been riding with a friend..... My body may still be on the mountain side. Unbelievable road,Rt. 80 on the west side of Blue Ridge needs to be done up and down, I like to call it The Devils Staircase We met the man that plotted the route and he ask us if it is better than The Dragon YES it is. BTW great town and gas on the other side. on September 3, 2009 0 out of 1 members found this review useful. on August 4, 2009 0 out of 0 members found this review useful. i use 80 as part of a longer ride and i believe for the thrill vs. cops ratio it offers a better value than the dragon. It could actually be another dragon if more people knew about it. A great ride from 226 to 70 to 80 to BRP to 226A to 226 to 223 to BRP to Blowing Rock...back on 221 to 18. A great ride. Try it. but it does take about 4 hrs. on June 18, 2009 0 out of 1 members found this review useful. This is a great ride. I usually go up 80 to the BRP, go north/east to Little Switzerland, eat, then come back on 226. Both roads are great riding. Got caught in a monster rainstorm coming down from Little Switzerland once. Made for a very interesting ride that day. Sure was exciting though. also check out the ride between hwy 80 and Little Switzerland on Hwy 226.